I am having the worst time printing out the jaw. There is something fundamentally wrong with the model and I don't know what it is. The skull printed perfectly the first time. The jaw fails on one side only each and every time. I've never had a solid object print fail on just one side while the rest works perfectly. I see on here that another guy had a similar issue so I don't think this is just an isolated problem. If anyone has any advice, I'm all ears. It doesn't matter how it is oriented, sliced, or printed, it fails in the same place each and every time. I'm going to try to fix the broken jaw model and when I get it to print correctly, I'll do a remix. I disagree with your assessment. There are dozens of makes of this model without a problem and I assure you it is not an issue with the model itself. It is most likely a slicer setting or printer capability issue. If you.don't have a heated bed, maybe the lower jaw needs supports or it slips when printing. Maybe your over extruding so when it gets to that point in the print your nozzle bumps the part and causes a print issue. I'd try printing the original model I remixed this from (Makerbot's T-Rex lower jaw) and see if you get a similar error printing that one. That is my print of the jaw in the original format, not the low-poly remix you did. Now, like I said: I really don't think that it is my printer or my settings. I did as you suggested, had 3 failed prints that all had a very unique manifestation (all were consistent in where and how they failed), and a fail that echoed the exact same way another person experienced. 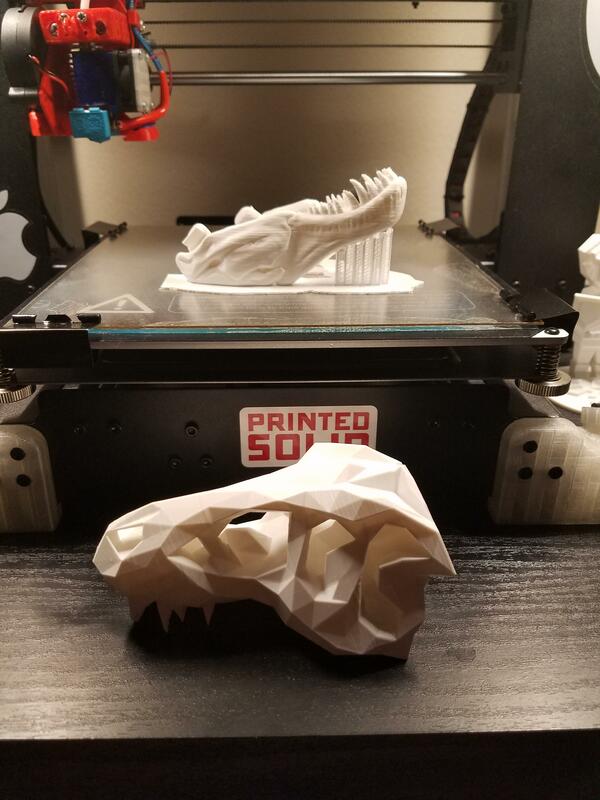 I printed the skull and jaw scaled down 25%. You mentioned that you printed yours at 50% the original size (from the original publishers). Maybe some artifact exists that isn't quite evident at 50% but creates a bigger issue at other sizes. I'm grasping at straws here but I'm seeing if you want to open a dialog about this. I already printed the skull and while it looks awesome, I really need the jaw for it to be complete. You have had myself and another person mention having an issue with just the jaw so I can't be objective and think that this is just transient artifacts. My printer is dialed in and has very tight tolerances as I print at very high resolutions (the skull was printed at 0.12mm to see how it would do but the jaw was printed at 0.28mm to provide a quick demonstration that it wasn't my printer--I usually print at 0.04mm for high quality models). From my experience--and for posterity for others that may see this comment--I noticed that the right side of the jaw, below the TMJ where it touches the bed, it doesn't seem to have much surface area with the bed as compared to the other side. Eyeballing makes it appear fine but as my failed prints have consistently outlined, the fault seems to exist there. The rest of the print is fine; so much so that the rest will print on top of the failed area and complete without an issue. It's not adhesion, extrusion, leveling or a planar squaring issue as it still occurs when I change the orientation and location on the print surface. I can assure you that it isn't anything on my end. If I change the orientation, the problem happens at the exact same place. I'm not over extruding, either. I was able to print the skull perfectly without the first issue but the jaw keeps having the same issue. what did you use to low poly it? could you make this one part? I want the stand seen in the pictures, where can I find it? I know this is a little older, but does the T-ReSkull_rod (from the original model made by makerbot) fit in the skull part. I printed it and it looks like the hole with a key turned into a hex. Will this be a problem? It should still work. I used the original stand when I printed this. Hi, where did you get the stand design from ? suprisingly the top jaw printed fine without supports, the bottom jaw i've had 3 failed attempts at different speeds. Without a heated bed it seems to have issues slipping 75% of the way through. going to try the bottom jaw with supports tomorrow. In what orientation did you print the top jaw? Mine printed supports all throughout the holes and they're basically impossible to remove, not to mention the raft and missing teeth, etc. This should be printed without supports and in the orientations show in the model file previews above. Works best with a heated bed. Say thanks by giving 3P3D a tip and help them continue to share amazing Things with the Thingiverse community. Say thanks and help 3P3D continue to share amazing Things with the Thingiverse community. You'll need a PayPal account to tip 3P3D. Click the button below and you will be redirected to PayPal. Once the payment is complete, you'll be brought back to Thingiverse.